Eagle Investment Systems, a BNY Mellon company and a leading provider of financial services technology, provides enterprise-class software based on a relational database to large financial institutions, including its parent company. Eagle Data Management manages vast amounts of financial data for clients, but the organization was looking to further increase its ability to provide world-class solutions. Facing cost pressures, the need to react quickly to changing market conditions, and demands for data-driven decision making, Eagle’s clients are becoming more agile. To help meet their increasing demands, Eagle made the decision to digitally transform its product offerings from a traditional relational technology stack to a Hadoop- and cloud-based SaaS platform, beginning the transformation process in 2017. As the foundation for its strategy, Eagle brought in key individuals to drive the transformation. Chris Stirrat explains how Eagle went from incubation to an enterprise-scale solution in just 10 months—everything from hiring and forming a team and defining processes to making technology choices and building and deploying big data software—using a Hadoop-based big data stack and multitenant architecture, transforming software creation, delivery, quality, technology, and culture. 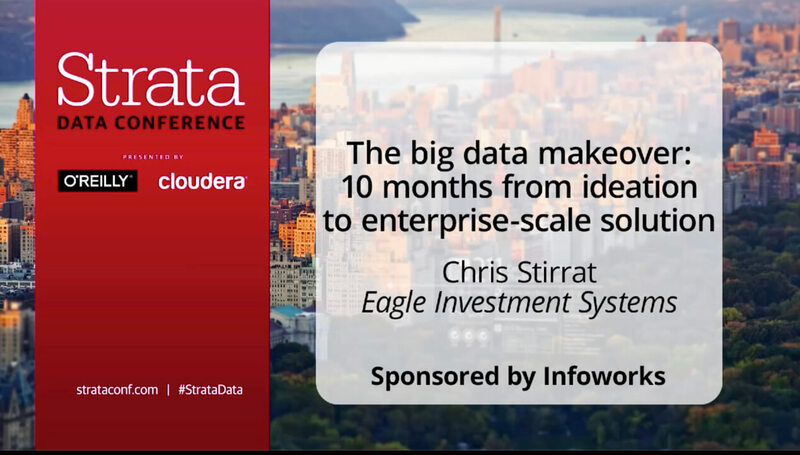 This 12-minute video is a "highlights reel" from Chris' presentation at the Strata Data Conference.